MEIGS COUNTY — When Ret. Chief Master Sgt. James Bailey travels to his final resting place in Arlington National Cemetery, he will not travel alone. 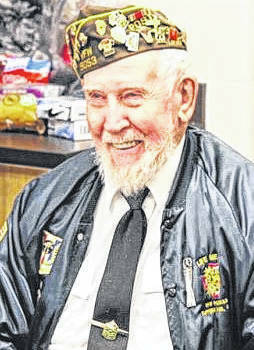 WWII veteran and longtime Meigs County resident Bailey passed away Feb. 11, 2018, and on Friday, July 20, his family and members of several bike clubs and veterans groups will accompany Bailey’s remains on their journey. Arlington National Cemetery was established during the Civil War as a United States military cemetery. Today the 624 acre cemetery is the final resting place for over 200,000 veterans, active duty service members, and their families. Bailey served in the Army in WWII and later in the Navy, and Air Force. He retired from the military in 1966, and during his career and received numerous awards and decorations. As his son Clinton and daughter-in-law Carissa Hill Bailey and several grandchildren leave the White-Schwarzel Funeral Home in Coolville at 5 a.m. on July 20, they will be joined by Meigs County Bikers, Revalatorz, Los Cuervos, Justice Riders and Red Knights. Members of Pomeroy American Legion Drew Webster Post 39, Middleport Feeney Bennett Post 128, Tuppers Plains VFW Post 9053, Racine American Legion Post 602, Meigs County DAV Chapter 53, and Meigs County Honor Flight Advocate JoAnna Newsome will travel with the group by car. He also reminded riders that safety was the main concern, to be on the lookout for deer, and to remember to bring helmets to meet requirements in states through which they will be traveling. With scheduled stops in Bridgeport, West Virginia, and Cumberland and Frederick, Maryland, the group plans to arrive in Arlington for the 3 p.m. ceremonies. The run will leave White-Schwarzel Funeral Home in Coolville at 5 a.m. on July 20.